Why are fennec foxes' ears so big? Click on the hotspots to see the plants and animals or on "Download PDF" for the colouring sheet. Take a trip around the world in this fascinating lift-the-flap book. With over 80 flaps to lift, intrepid explorers can discover our world, from the layers that make up planet Earth to the tiniest insects in the rainforest and the creatures who live at the very bottom of the sea. Includes pages about the hottest and coldest parts of the world, and a map with lift-the-flap details about each continent. A colourful and fun introduction to geography with internet links to find out more. 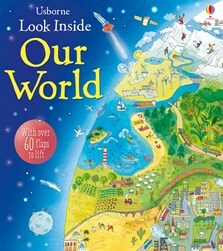 From the moment you turn the first page, both you and your children will be caught up with looking further into our world of geography and geology - and this clever book... pure educational fun. The Look Inside series of books are ingenious and this title is no exception. The colourful and exciting pages will have children engrossed from the moment that they turn the cover.